Camps let executives live out childhood dreams for a few thousand bucks. NEW YORK (TheStreet) -- Most of the time, Fred Dawson is a financial planner at a wealth management firm in Delaware. But every once in a while, the self-described "rock star wannabe" drops a few thousand dollars for the chance to play keyboard with the likes of The Who's Roger Daltry and former Rolling Stones bass player Bill Wyman. Dawson is a denizen of Rock 'n' Roll Fantasy Camp, a multiday experience in which would-be rock stars form bands and perform songs under the direction of veteran rock star counselors. Founded by producer David Fishof (who also produced Ringo Starr and his All-Starr Band), the camp takes place in major performance venues all over the world. Upcoming camps include Philadelphia (Oct. 22-24 at the Trocadero Theatre), Dallas (Nov. 12-14 at The House of Blues) and Chicago (Nov. 19-21 at the House of Blues.) Camp counselors will include Dickey Betts from the Allman Brothers Band, Mark Hudson of The Hudson Brothers and Kip Winger of Winger. An upcoming camp in New York (Jan. 13-17) will feature Roger Daltry. Camp packages generally start at $1,999, but can exceed $10,000 for five-day experiences. What he paid to go to a camp in London would have paid for "a nice new car," says Dawson, but he paid without qualms -- the upcoming camp in Philadelphia will be his ninth. "I've got to play with just about every one of my rock idols," adds Dawson, whose camp band names have included Spinal Cracker and Feral Katz. "My 'been-to-the-mountaintop' experience" was at the London camp, where I got to play 'Whiter Shade of Pale' with Gary Brooker of Procol Harem in Abbey Road Studies on the same Hammond Organ that The Beatles used! I can die a happy man." 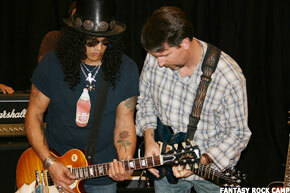 Slash, one-time guitarist for the band Guns N' Roses, works with executive Vaughn Merlyn at a recent Rock 'n' Roll Fantasy Camp. Camp bands are largely made up of white-collar executives, including Oracle ( ORCL - Get Report) co-founder Ed Oates, who liked the experience so much he invested in the company. "For an executive, this is the most interesting thing that they learn: that when you're in a band you have to pay attention to other people, it's not just about you," Fishof says. Along with producing a TV show about the camp for Viacom ( VIA - Get Report) channel VH1 Classic, he is working on a book called Rock Your Business that equates running a corporation to running a rock band. Oates concurs. "Every member has something to contribute, and that success means not only that the group succeeds but that we as individuals succeed," he says. "I think all successful leaders -- Larry Ellison, Roger Daltry -- share not only high skill levels, but have great self-confidence. They basically 'bet it all' on themselves and their founding members." Indeed, campers report that their stage performances help boost performance in their day jobs. "The secret thing I picked up was motivation," says Laura Sperber, an amateur drummer and president of rare coin dealer Legend Numismatics whose camp experiences included jamming with Jane Wiedlin of the Go-Gos. "The camps have been the most motivational things I have ever done in my life! For the following 30 to 90 days -- after I get my hearing back -- I am more focused, driven and happier in my business." If nothing else, grown-up camps will provide cocktail party conversation fodder for a lifetime. "My personal self confidence and self esteem has taken a giant leap forward," Dawson says. "Nobody has the bragging rights that I do!" -- Written by Carmen Nobel in Boston.